If your child loves dogs, he or she will enjoy dog games for kids. From Blue and Martha to Scooby Doo and Clifford the Big Red Dog, there are many games online and available as apps. Some dog games for kids, free to play or download, can even teach important skills. You'll also find fun options to purchase, from apps to board games. Discover different types of kids' dog games and where to find them. PBS Kids is a favorite among children, and it offers dozens of different dog-based games featuring popular PBS characters such as Martha and Woofster. Create a virtual super dog, play doggy word games, treat virtual dogs to steaks and bones and much more. Fetch has its own section; can play a variety of fun games with the dog Ruff Ruffman such as CSI: Hat Snatcher, Disco Fiasco or Move It or Luge It. Some PBS games require a free Adobe Flash plug in to play. The Disney LOL website also has a variety of dog games with characters from shows and movies like 101 Dalmations, Lady and the Tramp, and Dog With a Blog. Play these online Disney games that include include racing games, matching games, puppy training and others. Nick Jr. also has a number of games that feature popular puppy pals from Paw Patrol. Kids can play on a puppy playground, participate in daring rescues and have a doggy dance party. Poki Kids is a kidSAFE-certified website with tons of games for kids, including several based on dogs. You can create a wacky dog, do stunts or play dog challenge games. Parent should know that this site does have ads. Didi Games features several dog and puppy games. Many of these are puppy makeover and style games, great for kids who enjoy virtual dress-up games. Play Spin Round Puppy, visit puppy salons, or decorate Snoopy's kennel. Pet Rescue Saga is a fun way for kids to pass the time, and it's available to play online for free from game giant King. Similar to Candy Crush, this game can help build puzzle-solving skills. You can also play using the game's app. Parents will love SumDog because it's an education-based game that uses and interactive dog to keep kids' attention. Students or their parents can create a free log in to play math games. If your child is a fan of Scooby Doo, head over to the Cartoon Network website to play free Scooby Doo games, including Scooby Trap and a Scooby Doo Spooky Snack Search. In addition to playing fun games that let kids do win, there are also plenty of options in virtual dog and puppy games and apps. These can vary in content, but may have children take care of basic puppy needs, take the dog to the vet, play with the dog and more. These can also be helpful teaching tools! See the following for ideas on where to find virtual pets. The Littlest Pet Shop allows kids to choose a favorite character who can choose to adopt and care pets from a collection of 150 animals, including lots of cute dogs. In addition to feeding, grooming and caring for dogs, kids can also play mini games and build houses and play areas for their furry friends. It get a 4.3 star average from Google Play reviewers and 4.5 from App Store users. It's free to download and rated E for Everyone. In Dog Town, kids can adopt puppies from the town's pet shop, care for them, groom them and train them. Once pets are trained, you can send them on quests. It gets an average of 4.6 out of 5 stars according to Google reviews and 4.9 on the App Store. It's a family-friendly game that's rated E and is free for Android and Apple devices. When you download Boo - The World's Cutest Dog, you adopt Boo and be able to feed, bathe groom, and dress him up! This pretend-play game is geared towards children ages 6-12 and gets an average of 4.5 out of 5 stars on Google reviews and 4.8 on the App Store. It's rated E and free on Google Play or the App Store. My Virtual Pet Dog allows you to adopt Louie the Pug and care for him. Along with taking care of Louie's needs, kids can also dress him up, participate in daily missions, play mini games and daily bonuses for playing with Louie. It's rated E for Everyone and gets an average of 4.7 out of 5 stars from Google reviewers and 4.8 from Apple users. It's available at the Google Play store and on the App Store for free. FooPets is a paid site that requires either a one-time fee of $14.99 (one-time price for three pets) or a monthly fee starting at $4.99 (up to 60 pets). It's a virtual pet game online that was developed by a veterinarian to teach kids about caring for dogs. Once a parent has registered and paid kids can start adopting a virtual FooPet dogs and get access to food, water, toys and access to an area to care for and play with the pet, including grooming. Scholastic Software Clifford The Big Red Dog Reading - This product features a variety of learning games built around this popular dog character, and it will work with Windows and Mac systems. Get it for about $10 for Windows or Mac systems. Scooby-Doo! Jinx at the Sphinx - Search for clues and solve puzzles to help Scooby and the gang find their missing friend Thelma. The game is designed for kids ages 5 to 10. It's available on Amazon for about $17. Dog-Opoly (about $20) - Monopoly created a dog lovers edition that can be enjoyed by anyone age 8 and up. Paw Patrol Memory Match (about $9) - This make-a-match board game, similar to the classic Memory game, helps young Paw Patrol fans improve memory skills and match pairs. Designed for ages 5 and up. Soggy Doggy (about $10) - Players race around the board giving the dog a bath. If you get soaked, you go back to start. The game is designed for ages 4 and up. Diggin' Doggies Board Game (about $20) - Parents and kids can race around the board and try to get their doggy all his bones. This game is for ages 3 and up and helps teach counting, hand-eye coordination and other skills. Sequence Dogs (about $20) - Made for ages 7 and up, this game is a combination match and board game that helps teach concentration and sequence. Diggity Dogs Game (about $15) - This card game is played similarly to 'go fish', but you have some fun twists like standing dog characters and dog-inspired cards. Made for ages 4 and over. 3-D Dog Playing Cards (about $7) - These cute playing cards let kids play all their favorite card games with the fun a 3-D pooch covering the front of each card. Dogs are one of the most popular themes for kids' games. It is easy to understand because dogs are among the cutest and cuddliest animals around, and many of the animal game choices are also pretty fun. 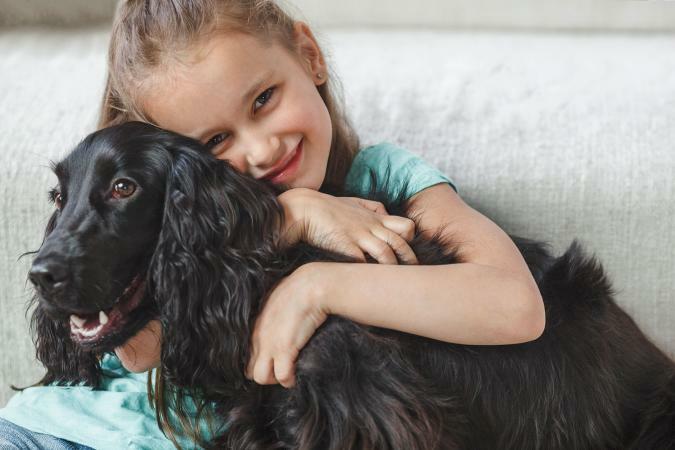 Whether your child plays a dog game because the dog reminds her of her own canine companion, or she simply loves anything dog-related, there are plenty of games that can capture her imagination as well as teach her new ideas. Explore these fun options when you are searching for dog games for kids.